Our interactive online revision package for the GP ST Stage 3 assessments will help you prepare for your selection centre day. This service complements our intensive 1 day Stage 3 courses that allows you to practise EVERY stage 3 task. 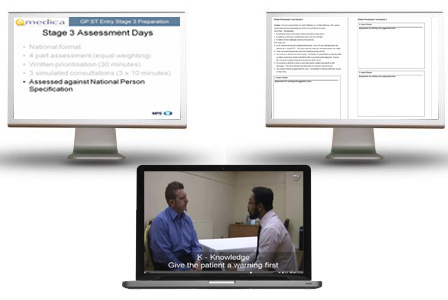 The service consists of an online course made up of video tutorials, videos of high scoring consultations (all 3 types) and a set of sample tasks for you to practise. A subscription costs £69 for 2 months or £99 for 4 months - you will be able to access the materials as soon as you subscribe. Having examples of high scoring consultations for all 3 types will allow you to see exactly what a great consultation looks like, and help you to put some of the techniques discussed in the lectures into practise. By including a live timer, you can also see how to use your time to demonstrate all the areas needed to help you get a really high score and hopefully get your first choice job.You can see some actual screenshots from 4 of the 6 consultations above. Our sample tasks are in the same format as the real exam, to allow you to familiarise yourself with the format and help you to practise with your colleagues. All 30 simulated consultations come with a doctor's sheet (with instructions laid out exactly as in the real exam), a sheet for the patient / relative / colleague (with detailed background and issues to allow role playing), and an examiner's sheet, with key learning points. There are examples of complete, detailed high scoring responses for written prioritisation exercises to help you understand the difference between a really high scoring response and a poor or mediocre response. "The emedica online question bank was very useful in preparing for the SRA exam. I attended the Stage 3 Assessment course and used the Stage 3 online service which was excellent in preparing for stage 3. I got 52/52 and I got my top deanery, London! Thank you Dr Rahman for all your help. Keep up the great work. I will be using your resources for the rest of my GP training." "I am just emailing to thank you for the Emedica resources and let you know I got my first job offer with full marks in essay. The online resources were fantastic. Many thanks!!" "The explanation on emedica site was enough to get me through and secure my first choice with a 52/52 score on stage 3. Thank you Dr Rahman"
"The practice videos for stage3 is very useful as well as the answer from written task. I learnt a lot. To be honest, I only studied 2 days before the assessment, all I did was watching the videos and reading the answers and practise all by myself within two days. So the materials in the website were a huge help for me." "Very good resources for gp stage 3 online revision- practiced all the written and consultation exercises." Stage 3 course and online course were the most useful for me. The course definitely helped me to get 52/52 at Stage 3! Very pleased to get one of my top choice jobs in North London! Emedica online revision gave me insight as to what to expect from stage 3 and I really appreciate that. I found the practice papers for the written part particularly useful as well as the video simulation demonstrations. The online resources for stage 3 were excellent, the videos were so helpful and there were so many scenarios to practice for all the exercises. Thank you Dr Rahman. I got my first choice offer! I need to say a big thank you to Emedica as I only used their revision resources and I scored a 52 in the stage 3 and 572 in the MSRA, and most importantly an offer for Belfast ST GP programme! I will be recommending it to friends in the future. "Many thanks for your help and advice in the nicely organised and informative course for the stage 3 interview at Birmingham on 20th sept. I got the offer for GP training to be started from Feb 2019. I didn't even practise a single station with anyone as I didn't have the opportunity except in that course. But also I took the online subscription of Emedica to see those helpful videos of consultation and practised the writing questions from there with proper timing which I did as far as possible in those few days.But I am sure I couldn't get this offer without your course as I had no idea about the structure of the interview. In the course I had a clear overview of the exam and also those videos helped me." "Thank you for your support and advice. Your question bank for stage 2 and the scenarios for stage 3 helped me prepare well in less than three weeks time period. I am pleased to share my result with you. I have been selected for a post." "Thanks a lot for the online training for Stage 3. I found that quite useful. And secured a post in Norfolk." "I just wanted to say that I used your Stages 1-4 course and used the online Stage 3 materials and I got 100% in the selection Center." 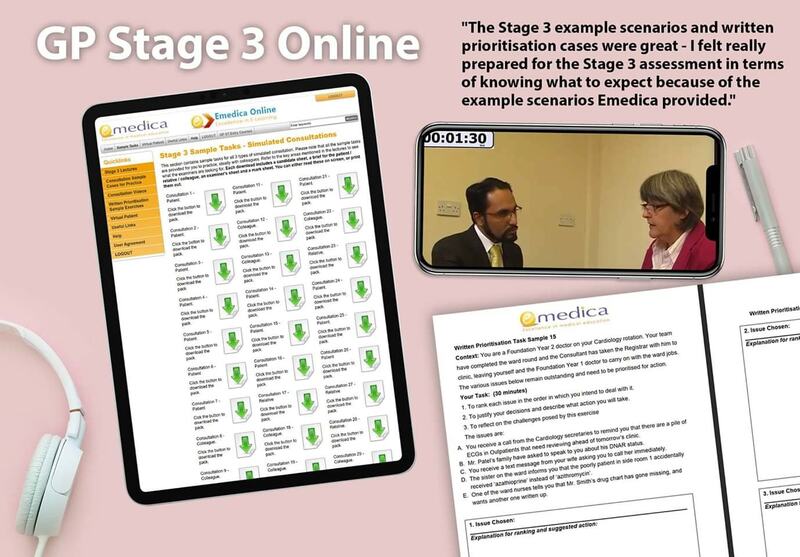 "The Stage 3 example scenarios and written prioritisation cases were great - I felt really prepared for the Stage 3 assessment in terms of knowing what to expect because of the example scenarios Emedica provided. The written questions were very time limited so having plenty of examples to do prior to the actual assessment was hugely beneficial. Many thanks." "I have used other online training materials, but this was the best. Very informative. Was very useful for my stage 3 interview. I have managed to get into GP training." "Emedica has been an invaluable tool. Don't think I could have managed without it, especially the Stage 3 course and online revision service. Can't praise them highly enough. Thank you Emedica!" "Emedica was the best resource that allowed me to get my 1st choice deanery. The best aspects were the Stage 3 online resources - the scenarios and practice papers for the prioritisation question - and the Stage 3 assessment course. In particularly the simulated patient practice was invaluable to give me confidence for the exam. Everyone is so friendly and approachable who run the course. The other thing to mention is the online Facebook group which I found out about during one of the course I attended. It answered many questions that I had." "The courses were really helpful, I managed to secure my first choice in a London deanery. Unfortunately, I could not attend the courses in person. However, I just did the online revision and used this as my main source of revision and it was great, in the limited time I had and of all the courses I did online, this was the easiest to navigate and most organized"
"I only had about 3-4 days to prepare for this course and was able to gather the necessary details to prepare from the online course provided to get through my exams. I was comfortable and unstressed at the exam center and I passed and was given my first-choice placement because of it. Very happy. Thank you." "It has been a great help to understand the basics of GP world. The key areas for the recruitment assessment process were clearly mentioned. To get a grip of what to expect on the exam day, both simulation exercises and written exercises were helpful. It has been a great experience all in all." "I highly recommend this for doctors who wish to pursue career in GP. Emedica helped me more than I expected to secure a place in NE deanery which will be started in Feb 2017." "Fantastic source for revision. Recommend to all, especially stage 3 online revision with videos, very helpful indeed"
"Excellent online resource. Great videos and tips. Very useful written exercise examples and model answers. Mark schemes for consultation skills extremely useful. Great service." "Very informative and systematic learning material. Highly recommend to anyone." "Found the material provided excellent and very useful when preparing for Stage 3. Very helpful hints regarding the communication skills stations of what the examiners are looking for. The material provided for the written stage was the most useful. I couldn't have prepared for this without the Emedica revision guide. Got my first choice deanery and job!" "I used the stage 3 online resource to prepare for the selection centre. The online lectures, written exercises and case scenarios were outstanding. I would like to thank everyone involved in Emedica as I think you have a truly amazing resource." "I am really happy and extremely grateful to all of the Emedica staff for helping me get my 1st Choice deanery (East of England). English is not my first language but this course gave me confidence and very useful tips. I had another course in London before this but this was definitely better. Both the Online Courses and especially the Stage 3 Preparation Course were Brilliant! I would recommend Emedica to everyone. "The online videos are very useful in clearly defining the way to approach each scenario. I struggled initially and I would not have been able to secure a place without them. A very big thank you." "The online resource was good and the practical course for stage 3 was also good. I particularly found the GP Facebook page very useful as I could practice the scenarios with another colleague by Skype. I managed to pass my exam Alhamdulillah. Thank you Emedica." "I found the scenarios provided for online revision for Stage 3 very appropriate for the Stage 3 assessment. I was unable to find time to attend a course due to work and family commitments, so this was a great solution for me. I am very pleased as I have secured a job in my first choice location." "Useful information which really did make a difference to my preparation." "The online content and the stage 3 day really helped and made a difference for me. I got accepted to Northern Ireland and whilst this was due to a lot of hard work on my part, the advice and practice on the stage 3 day as well as online resources proved invaluable. Thank you once again!" "Very good resource with good information on what to expect and good pointers on how to approach the day. Sample videos are excellent and very beneficial. The sample answers were also a good insight in to what was expected for the written exercise." "Great online tutorials and videos on the Emedica stage 3 online service. I also attended the course in Birmingham for stage 3. Well-constructed, concise and it increased my knowledge and improved my confidence." "Emedica stage 3 online revision was a very helpful resource for preparing for the GP stage 3 selection centre exam. I only used this for my exam and I have got my first preference place." "Both the stage 3 course and stage 3 online revision were invaluable tools in helping me gain a GPST place successfully. I felt so much more prepared and confident as a result of these resources and feel they were worth every penny spent. Many thanks!" "I thought the Stage 3 Online Revision was spot on. I was meant to go to NZ but then applied to Round 2 at the last minute and as all the exams were close together I did not have much time to revise. I paid for Stage 3 Online Revision and watched the clips before my exam and it was very similar to the exam itself. Keep up the good work." "Very informative online course. Described whole marking scheme and point scoring strategies." "GP stage 3 assessment course: Thoroughly well organised. Covered all essentials to successfully passing the GP entry assessments. Clear explanations given and relevant examples. Particularly appreciated the quality of the patient scenarios and the actors used. The online revision stage 3 had a good variety of scenarios at the right level of complexity. Similar to that encountered in actual station." "Very helpful! Especially the online stage 3 course which had good examples of how to approach the communication components!" "Very good. Excellent approach to teaching and interactive and innovative learning. Online course material was extremely useful. Excellent for preparing for this stage of the exam as well as for communication in difficult situations which I will use in the future for my training and beyond." "I used the Stage 3 online resources and they were extremely helpful." "Emedica provides a very informative comprehensive course and online revision course. I had both. I did not qualify in first round but managed to get through in 2nd round. Thank you very much Dr Rahman and fantastic team." "To all the team at Emedica, Thank you for all your help. I am thrilled that I got into my first choice deanery. The online lectures were a really helpful addition to attending the course in person. I would recommend this course to anyone thinking of applying to GP training. Thank you once again!" "The online revision for stage 2 and 3 was excellent and very realistic when it came to the actual exams." "Excellent online resources which have helped to gain a high mark in my written examination." "The OSCE revsion tutorials and videos were spot on, the perfect level of detail and rationale behind explanations. Would strongly recommend registering to familiarise yourself with the ranking station and OSCE stations." The online resources were by far the best I'd come across. Thank you Emedica!" I got two band 4s in stage 2 and then did well enough in stage 3 that I ended up ranking high enough to have been allocated to any of the programmes in Severn Deanery - and have accepted my first choice. I would like to thank you so much for all the help without which I definitely would not have done so well (particularly in the SJTs). I will be highly recommending your courses to next year's group." "I attended all of the Emedica preparation courses and used all the online resources and could not praise them highly enough. I achieved two band 4s in stage 2 and ranked 7/110 at stage 3, meaning that I got into my first choice area in my 1st choice deanery!" "Found website and content excellent. Having a new baby and baby brain I don't think I would have passed without Emedica. It allowed me to revise at home in short burst when I had a window of time around work and childcare." "I found the content and presentation very useful. 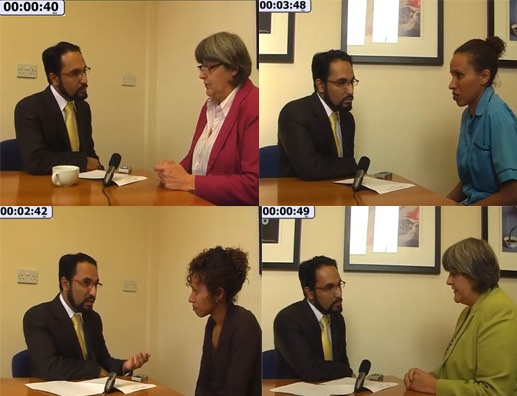 The simulated consultation videos were excellent as was the section of common mistakes and how to avoid them. As I did not have time to attend a stage 3 course, this online revision really helped me to secure a rotation in the Northwestern Deanery. Many thanks!"